What Is Garam Masala and How Is It Used? Indian vegetable or meat dishes often include garam masala for seasoning. In Northern Indian cuisine, garam masala is typically in powder form, while in the southern part of the country, garam masala is often formed into a paste with coconut milk, vinegar, or water. It is made year-round. Garam masala sometimes used on its own, but it can be mixed with other seasonings as well. Garam masala is a blend of ground spices used extensively in Indian cuisine. The spices for garam masala are usually toasted to bring out more flavor and aroma, and then ground. The word masala simply means "spices," and garam means "hot." However, garam masala doesn't necessarily constitute a particularly spicy blend. The powdered form is typically gluten-free, vegan, and vegetarian, while you will need to check the label for garam masala paste to see what is included. There is no single garam masala recipe. The ingredients differ according to the region as well as each chef's individual preferences. Garam masala from Northern India, including the Punjab region, often has only black pepper for a hot element and mostly focuses on aromatic and sweet spices. This garam masala will be quite mild, and any heat in the dish will come from adding hot peppers. The farther south you go in India, the hotter the garam masala is likely to be as red chiles are likely to be part of the blend. The spices also change, based on what is more common locally. Recipes are not only regional but also passed down through families. Learning to mix spices (to be a masalchi) is a matter of pride in India, and each cook strives to make the best garam masala blend. Garam masala is believed to have originated in Northern Indian cuisine, where it is especially found in traditional Mughal dishes. In Ayurvedic medicine, the spices in garam masala are warming, meaning that they increase the metabolism (rather than being hot in flavor). Northern India has more areas that have cold seasons, so warming spices are welcome. Garam masala spread throughout the Indian subcontinent and as far west as present-day Iran. If you are buying garam masala, you will need to read the ingredients in order to determine which spices are is included. 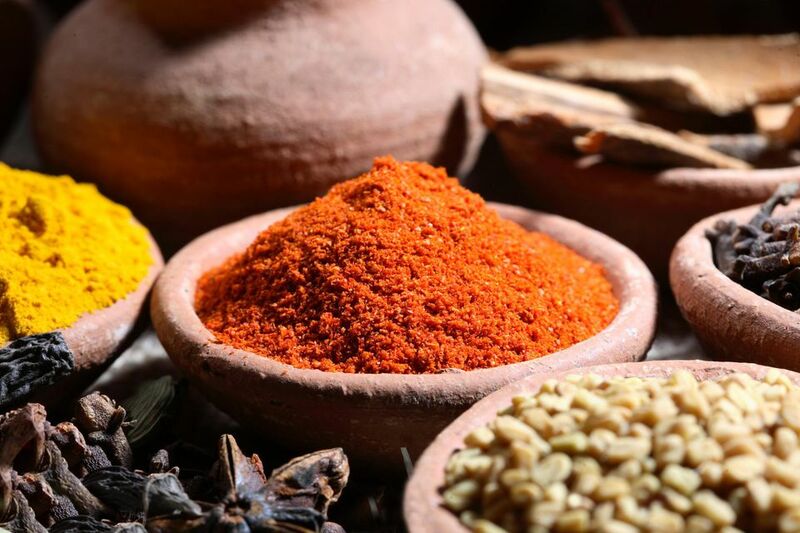 In variations on garam masala, ingredients may include turmeric, saffron, fennel seeds, ginger, garlic, mustard seeds, mace, star anise, tamarind, fenugreek, bay leaves, Malabar leaves, or dried red chiles. Garam masala adds warmth, sweetness, floral notes, and a touch of heat from the black pepper. It is intended to be a fragrant spice as well as flavorful. While cumin, coriander, and turmeric may remind you of curry, garam masala is generally not firey hot. Garam masala is usually added near the end of cooking so that it not only seasons the dish but adds to the aroma. Some additional garam masala may also be sprinkled on top of the dish. Traditionally, garam masala is made fresh from the component spices and used within a few days. It is often not the only spice and seasoning used in a dish. Garam masala is used with many meat and fish dishes. You will also find it in vegetarian and vegan dishes and soups based on legumes and vegetables. As garam masala simply means "spices with varying levels of heat," you have a lot of leeway when it comes to mixing up your own garam masala, or if you need a substitute when preparing an Indian dish. You can check the ingredient list for any recipe and mix it up with the spices you already have on hand. Try varying your garam masala recipe until you find the spice combination you like best. You can find garam masala in the spice section or international section of a well-stocked supermarket. Your best source is likely to be an Indian grocery or international specialty shop. Those stores are also a great place to buy the individual components of garam masala at a much lower price (and likely fresher) than in a supermarket. Making your own will from the component spices will give you the best flavor. Starting with whole seeds, your garam masala will be much more fragrant and flavorful than anything you buy in a jar at the store. For this recipe, you will need a skillet and a spice grinder or coffee grinder. Heat a dry skillet over medium-high heat and toast the coriander, cumin, cardamom, black peppercorns for about 10 minutes. Stir them from time to time to keep everything cooking evenly. When the ingredients have darkened slightly and give off a rich, toasty aroma, remove them from the pan and let them cool. Grind in a spice grinder or coffee grinder. Grate the nutmeg and add it to the mixture. Store in an airtight container away from heat. Store garam masala in an airtight container in a cool, dark area. Ground garam masala will lose its potency rather quickly, so it's best to use it as soon as possible. Aim to use it within a few weeks, although it won't spoil and you could use it for up to six months. Expect that you will need to use more garam masala in your recipe to get the desired flavor the older it gets. Garam masala is intended to balance different flavors, and so in using it you will bring out the flavors of the dish and may be able to use less of other seasonings (such as salt). Many of the component spices have different health benefits touted, but overall one thing often mentioned is that they may improve digestion. In the tradition of Hindu Ayuvedic medicine, garam masala is a warming spice that is intended to raise body temperature and improve metabolism.